SEATTLE--(BUSINESS WIRE)--Sep. 25, 2013-- (NASDAQ:AMZN)—The National Retail Federation rated Amazon #1 in its Customer’s Choice Awards, JD Power and Associates named Amazon a Customer Service Champion, and MSN Money has ranked Amazon #1 in its Customer Service Hall of Fame for four years running. Now, Amazon introduces the Mayday button, extending this world-class customer service to live, on-device tech support, right from your Kindle Fire HDX. The Mayday button is available exclusively on the new Kindle Fire HDX tablets, available for pre-order at: www.amazon.com/hdx. Available 24x7, 365 days a year. 15 seconds or less is the Mayday response time goal. You can see the tech advisor, they can’t see you. Simple and deeply integrated—the Mayday button lives in the Quick Settings menu, one tap away. 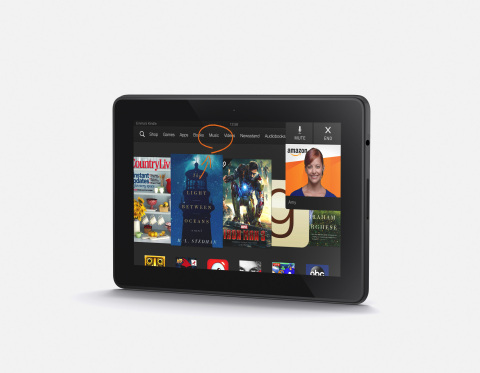 The Mayday button is available exclusively on the new Fire HDX tablets—read the press release: www.amazon.com/kindle-pr.